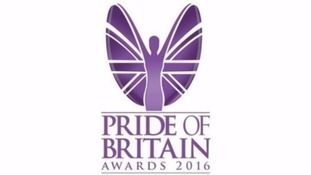 Sarah Clark reports on the South & East Yorkshire, Lincolnshire & North East Derbyshire regional finalists for the Pride of Britain Awards. The Pride of Britain bus rolled into Leeds today to collect nominations for unsung heroes across the region. This year's Daily Mirror Pride of Britain Awards was one to remember for our nominee in the fund raiser category, who went to London to represent Calendar. He didn't win the overall award but he did persuade two X Factor judges to make a very special call to his son back home near Skegness. Daniel Harris was there for us and his report does contain some flash photography. A North Yorkshire Police officer has won a Pride of Britain award after disarming a man trying to rob a shop at gunpoint. David Wood reports on the beginning of the Pride of Britain Awards ceremony with Dr Kate Granger representing the west of the Calendar region.